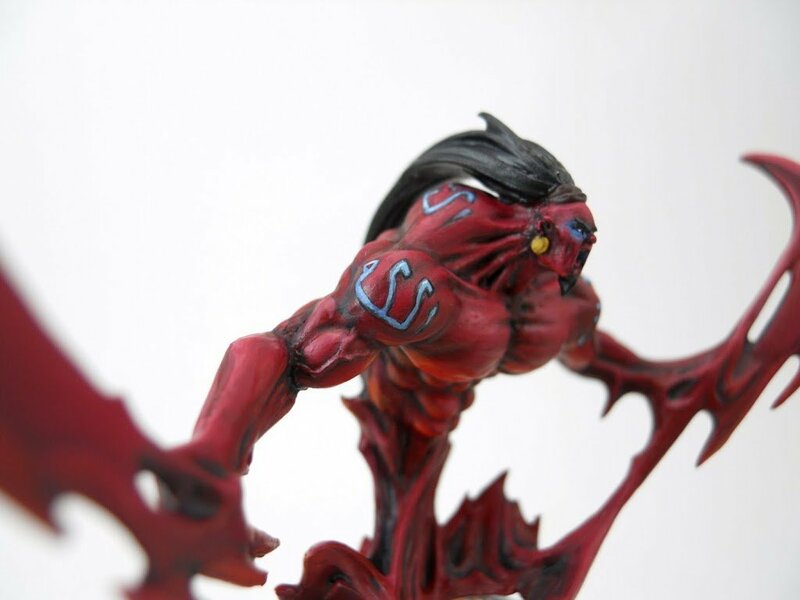 I’ve finally gotten an opportunity to paint a Djinn, so I had to go for something memorable. After a bit of thinking I decided blood red was the only way to go. I’m still working on my Hell Dorado Saracens; trying to find time for them in between my Warmachine projects and some other things that have been popping up. One of the coolest things about playing as the Saracens is you get to use some Djinn models like Husaym al Din here. 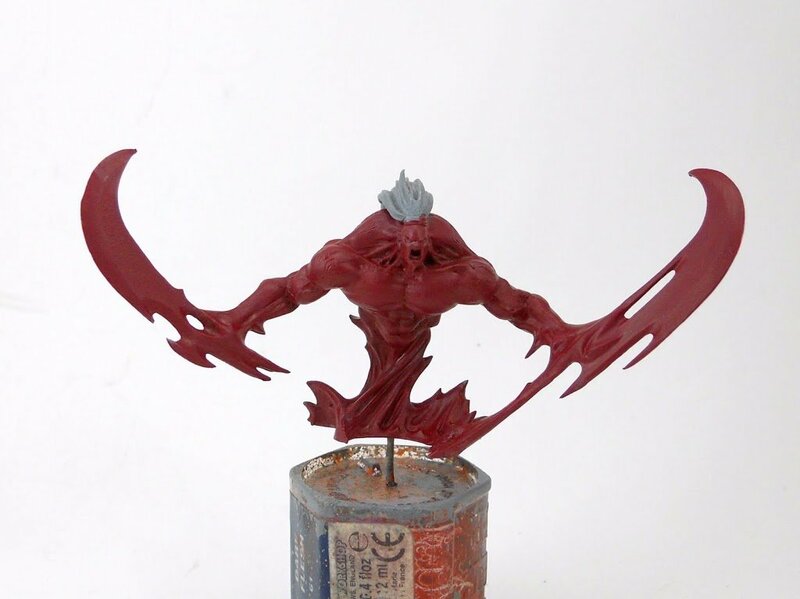 First off its just a simple coat of Mechrite Red over the Gray Basecoat. Then I wash the whole thing with watered down Scaly Green mixed with some matte medium. The reason I use this blue-ish green color for the wash is because it is a contrasting color to the red. 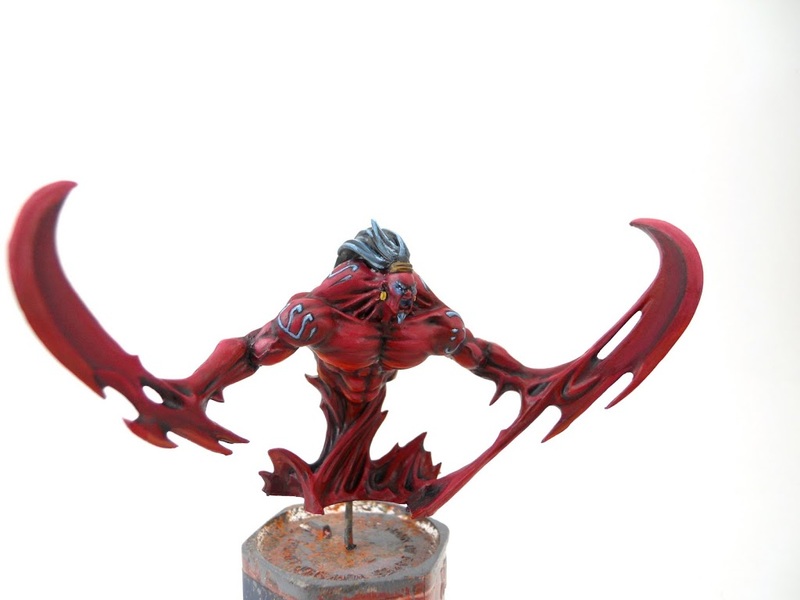 That means the red will visually pop that much more when its all finished. 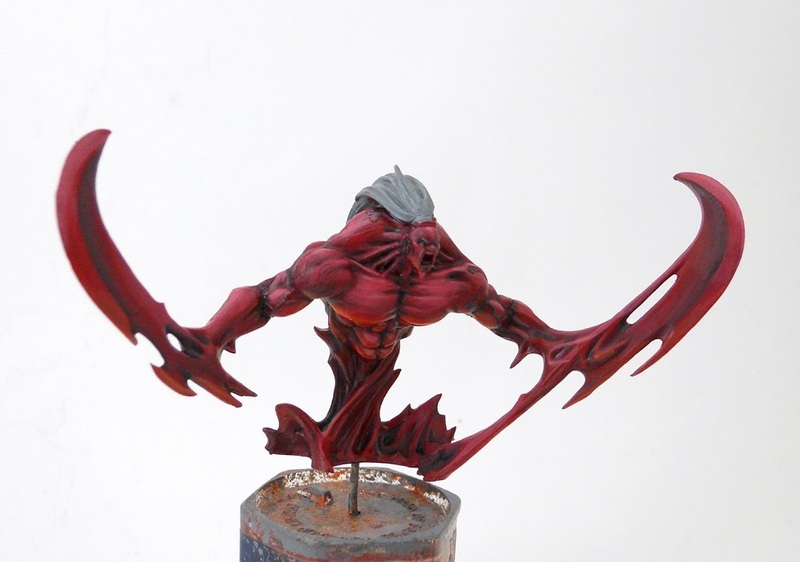 Then I start highlighting him beginning with a layer of Red Gore. Red Gore doesn’t cover very well, but that’s fine by me. It means I can apply it in multiple thin layers and get some nice blending in that way. 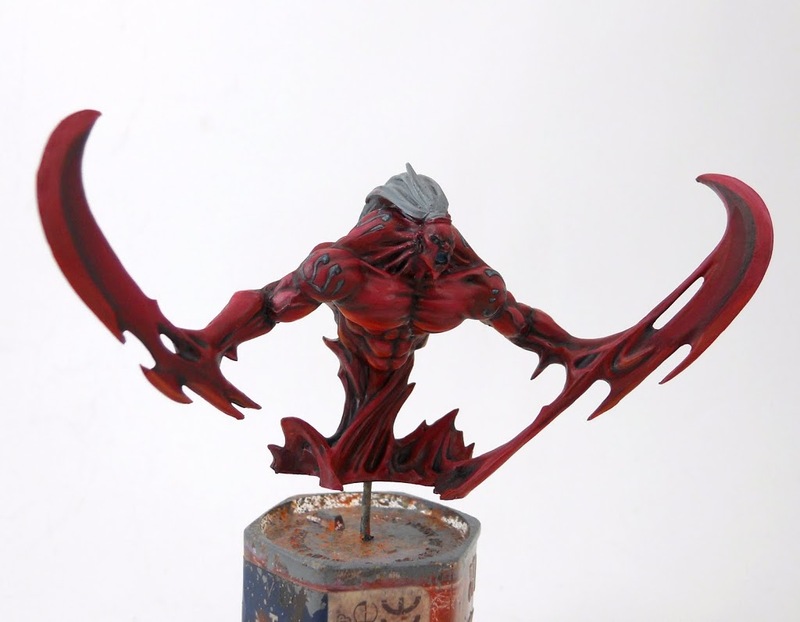 I continue by adding a little Blood Red to the Red Gore. 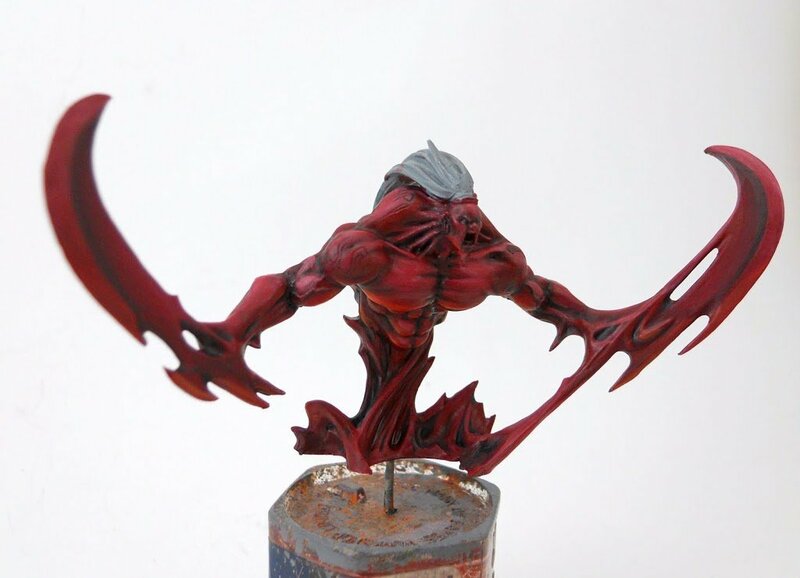 I add some Elf Flesh to the highlight mix and apply that next. 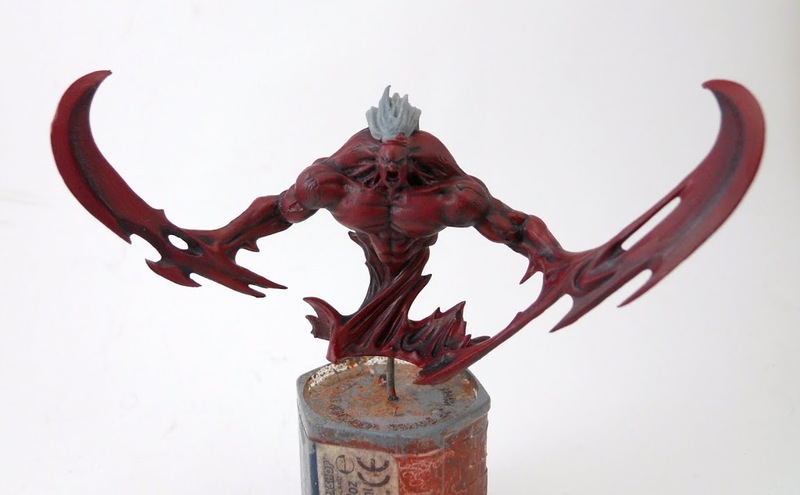 I also mix some Blood red and Blazing Orange together and apply it on the underside of his musculature, arms, swords etc. 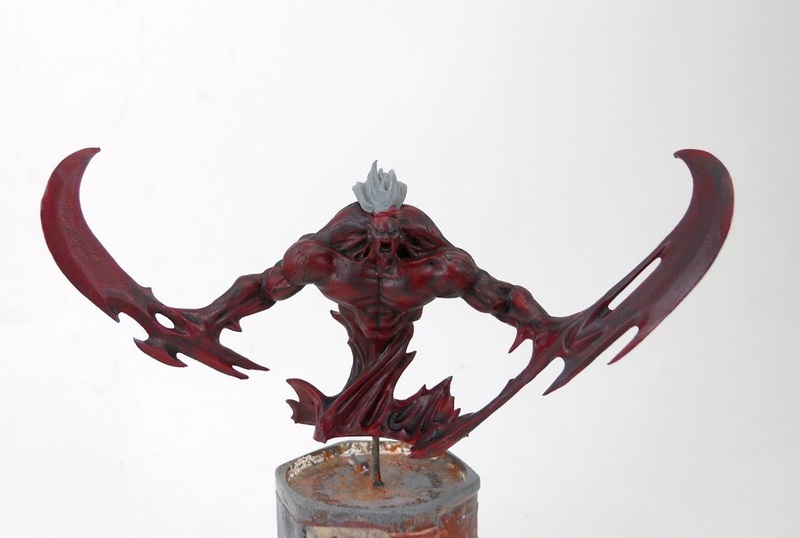 This under-lighting will hopefully give him a somewhat more glossy feel and help push the blood theme. I continue pushing up the highlights, mixing more Elf Flesh with the previous highlight layer, and more blazing orange with the under-lighting layer. 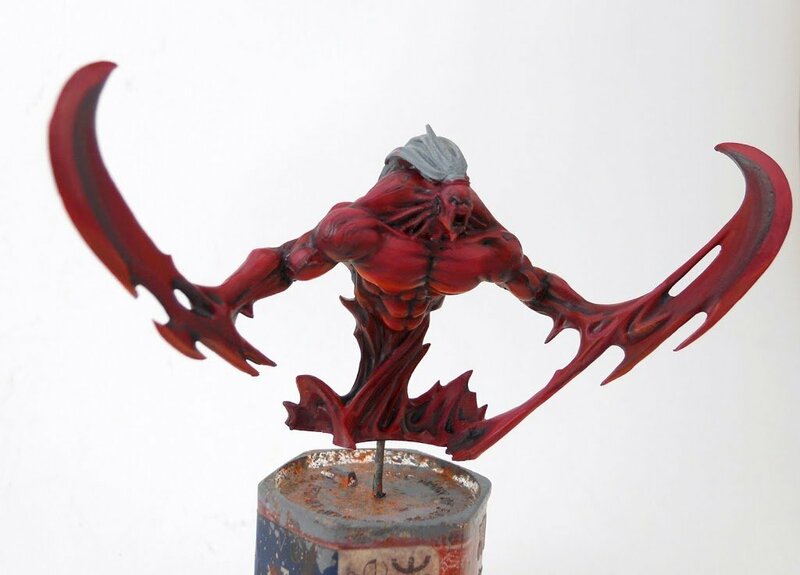 Then to even out everything I’ve done so far, I carefully apply a Baal Red wash to the entire model. Husaym has some interesting tattoos sculpted on to him. I decided I would use them to tie his color scheme to the rest of the my Saracens, who prominently feature a light blue color. I carefully painted all the tattooed areas with one of the light blues from the other Saracens, then washed them very carefully with Badab Black to define the regions even more. Then I painted back over them again with blue, then gave them a few blue highlights. I also gave him glowing blue eyes by painting a very thin layer of light blue around the eyes. The eyes themselves were painted with Space Wolves Gray. I gave the inside of his mouth a similar treatment, with a very light blue deep inside blending into a darker blue then into a deep red on its way out. At this point its down to just the few remaining details: hair, jewellery, etc. I wanted him to have a thick black mane, so I painted his hair black then carefully highlighted it up with blue. Then I painted his hair tie Snakebite Leather and washed the whole area with Devlan Mud. 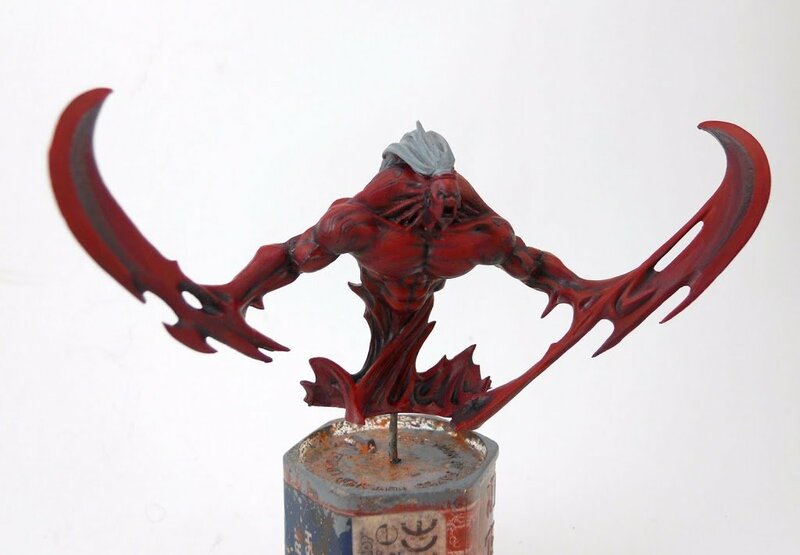 The very last thing I do before attaching him to his base is to give him just a few more red highlights here and there, trying to even out the blending on the swords in particular. 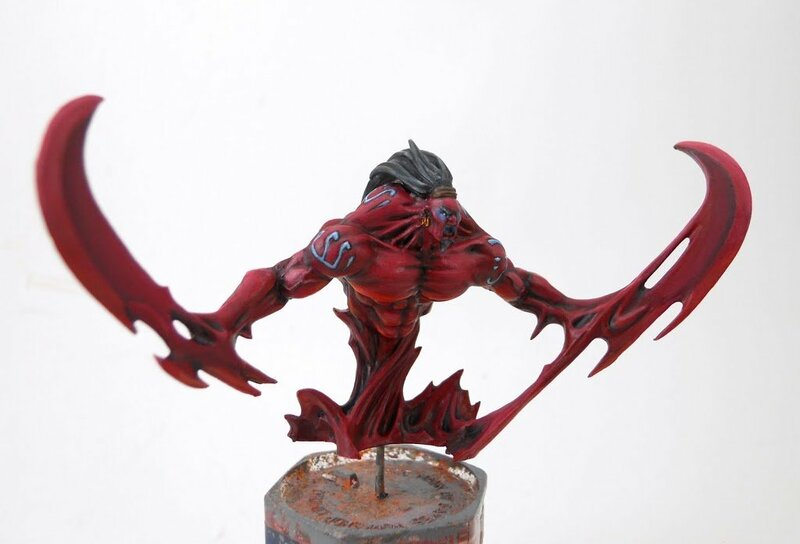 ~And there you have it… one brutal looking Djinn. 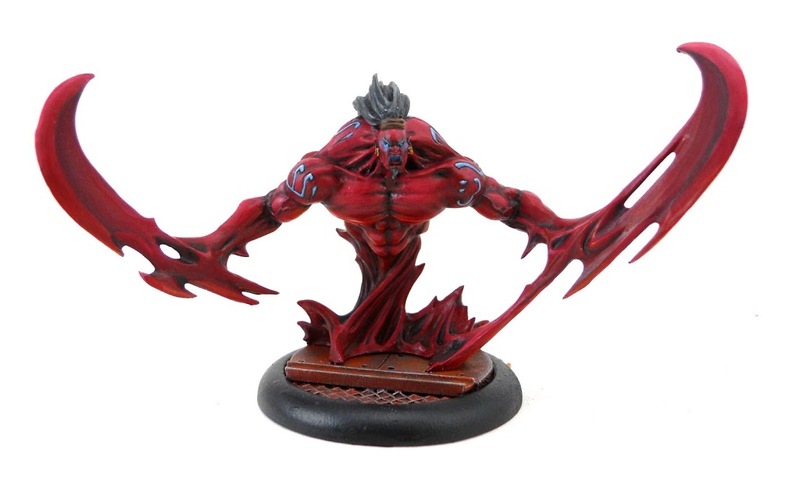 Of course I’m sure you can think of plenty of other minis that would also look great with a bold red skin like this.